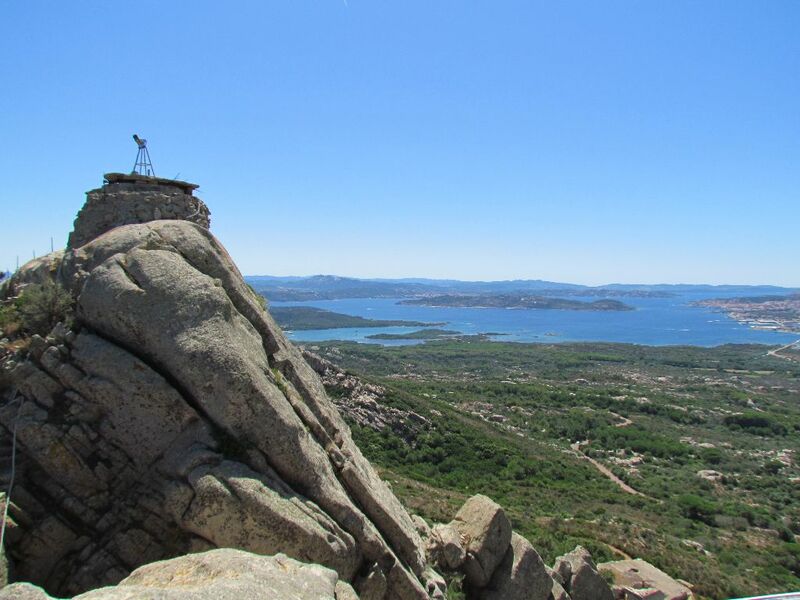 The Maddalena islands sit within a national park on Sardinia’s north east coast, just across the water from Corsica. A permit is required to visit and we hoped this fact might keep the number of boats down, now that we were ramping up towards the busy, high season months of July and August. The permit can be purchased on line (using Paypal) which gave us a 5% discount, then there was a further 40% off for being an owner operated sailboat. So with both discounts applied we paid €57 for a week, which we didn’t think was too bad at all. 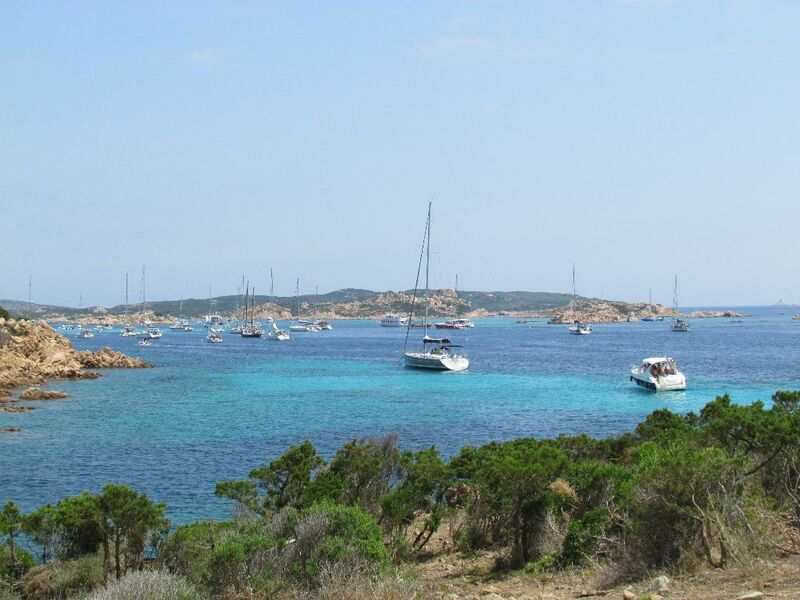 Our first destination was Cala Stagnali, an anchorage that from what we had read, is only lightly visited. At the entrance there’s a green can to leave to starboard, then a slightly confusing orange bucket on a stick which is also left to starboard. We reckon one boat that we saw coming in must have confused it for a red can and ended up passing it to port. They luckily got through without damage. Once past the marks, there are two transits to line up to give a safe water line of entry before the bay widens out. When we arrived there was only one other boat in leaving us plenty of room to pick a good spot. The other boat left that day and we spent the night alone. Bliss! 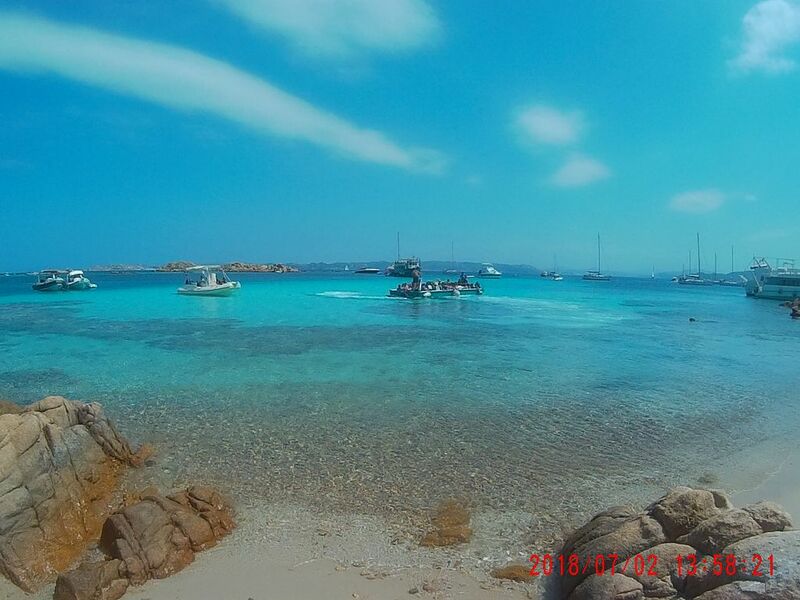 The jaggedy spine of Caprera island and it’s tree spotted shore provided pretty scenery, there is a small boat harbour where we could lock up the dinghy, several hiking trails nearby and a bus passes by that runs to La Maddalena town. With rock solid holding it was all so perfect that we ended up staying there four nights and using it as a base for touring ashore. 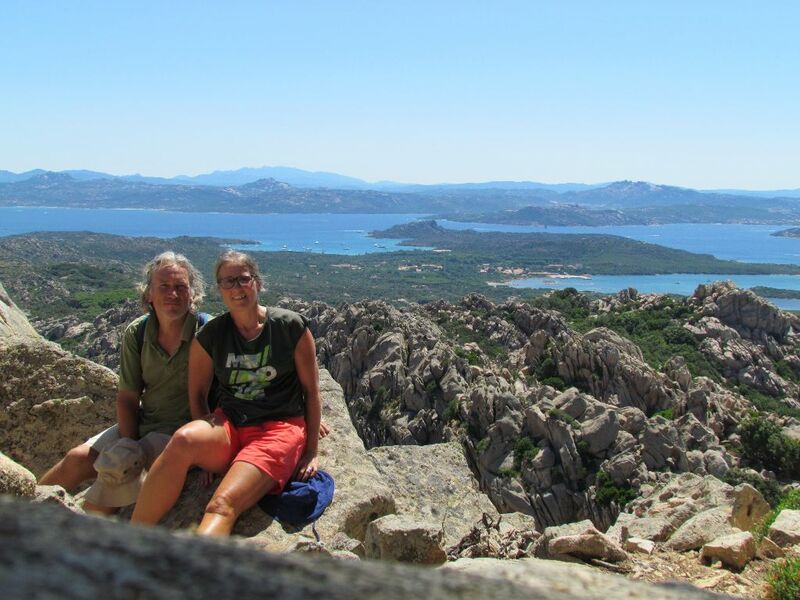 We covered over 20 miles on foot, exploring abandoned forts, climbing to Monte Tejalone, the highest point of the island for views to Corsica and checking out some of the other anchorages nearby which were much busier than Stagnali, so we felt no need to move Emerald anywhere else. 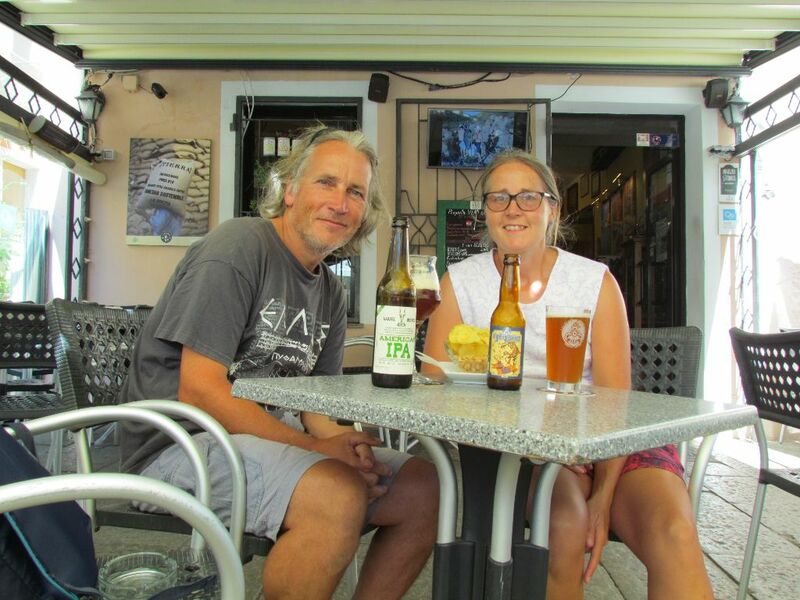 There was a day trip by bus to La Maddalena to sample some local craft beers and we also took advantage of free museum first Sunday of the month to visit the home of Garibaldi. We’d heard of him (although we have to admit that the first thing that comes to mind when his name is mentioned is biscuits, which are named after him) but didn’t really know what he was famous for. 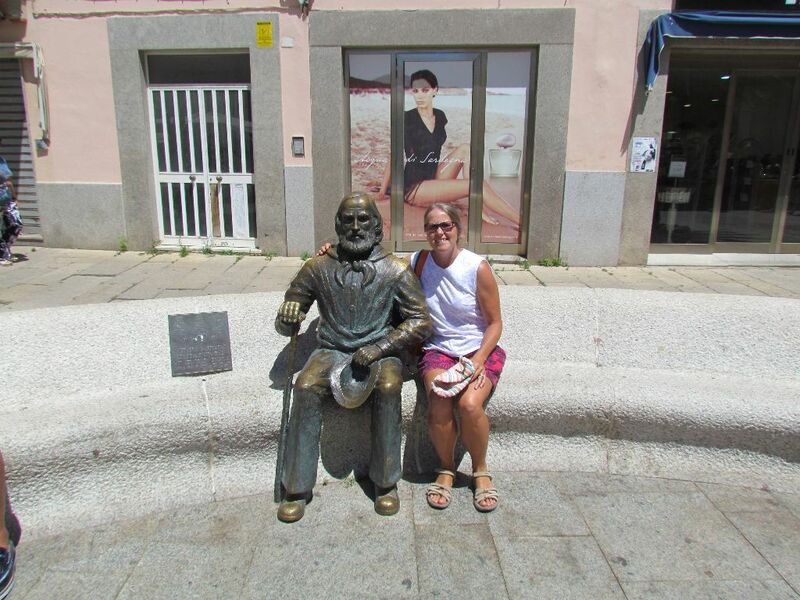 After a little research we discovered that he is considered a hero of Italy – credited as being one of the men who unified the country with an influence that spread far around the globe. His home on Caprera was a modest place, cool and airy on a hot July day and I imagine it was a welcome retreat from his military campaigns. 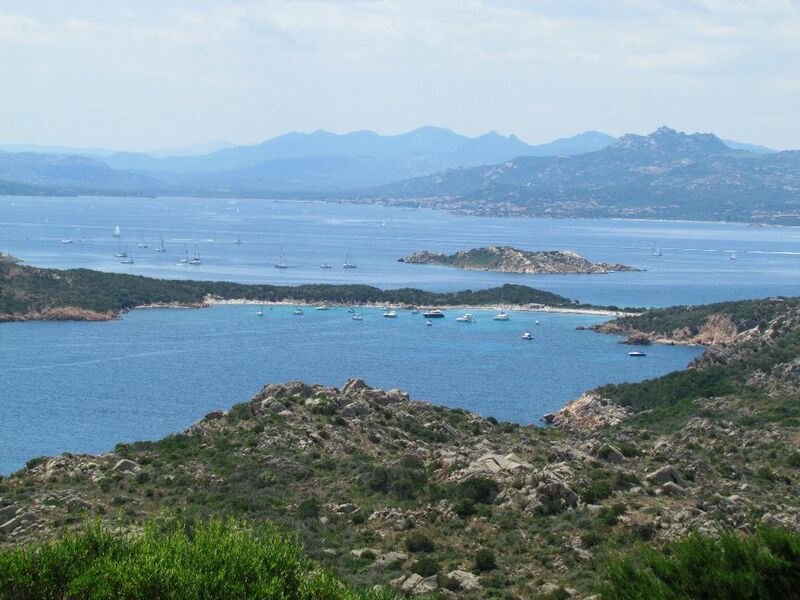 The single storey building is also where he died, with a lovely view across the islands to Corsica from his deathbed. We were going to try some of the other anchorages, so scoped them out on our walks, buuuuuuuut…. we were so comfortable in Stagnali that we ended up staying put. But for those who are interested, here are views of some of the other options around Caprera. The only downside of Stagnali was that the water was brown due to the muddy bottom, but it was still clear and we had shoals of little fish gathering under Emerald’s hull. 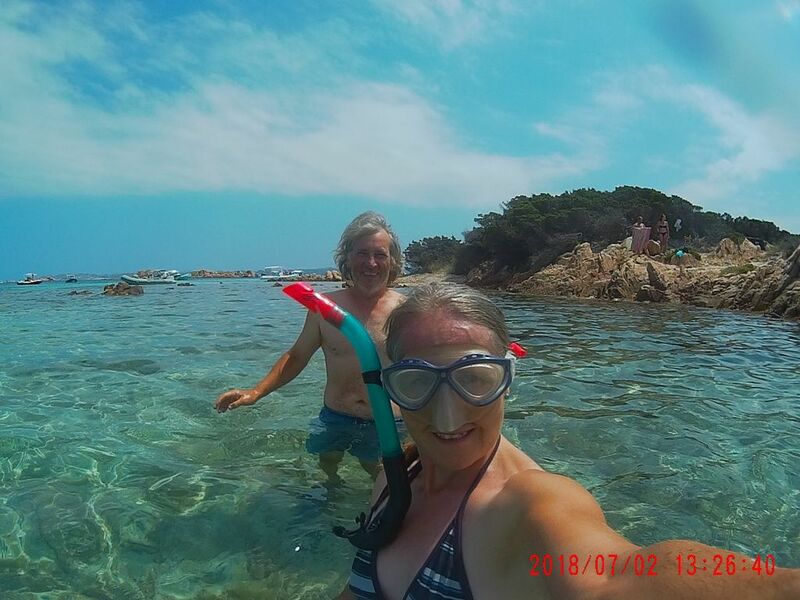 However, after 4 nights we felt we ought to see somewhere else, so on Monday morning we headed off to the northern most group of islands around Budelli. We arrived late morning to unexpectedly find there were mooring buoys there with divers at work laying new ones. Although the cruising guides say there are buoys, these were the first we’d actually seen in any of the anchorages. There were several still free so we picked one up at the back of the field, furthest away from where the trip boats landed their guests. Having not picked up a mooring since Croatia two years ago, we were very pleased to snag it on the first go, despite the wind picking up and trying to blow us away from it. A few unfortunates throughout the day were not so lucky and there were quite a few boat hooks left behind, dangling from the buoys as the approaching yacht got blown away and the pick up person didn’t have time to unhook the hook. 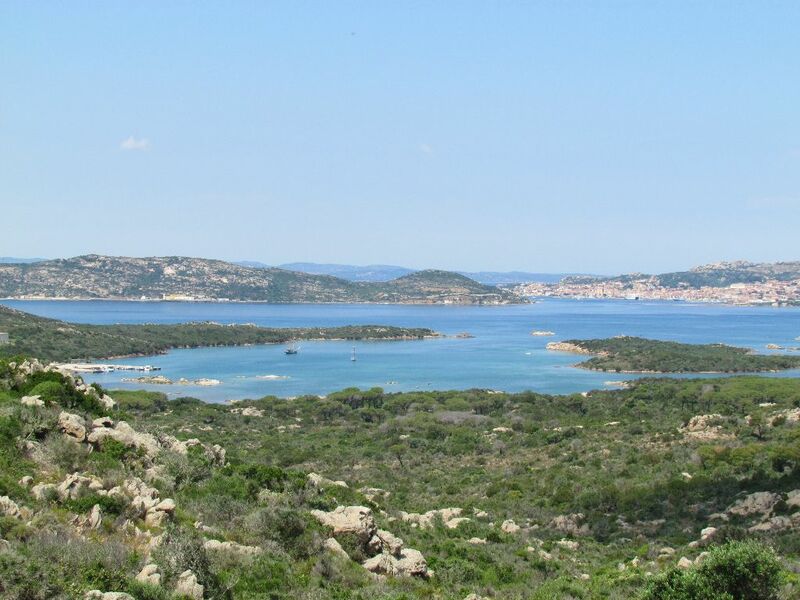 The islands sit on the eastern edge of the Straits of Bonifaccio, a notoriously windy place. Just after our arrival the wind blew strong from the north then a feisty 30kt westerly at times, but there was more wash and chop from passing boats than from what the wind created. There were also plenty of boats anchored, although not so much around us as our mooring was placed in 19m of water. As well as closer in to Budelli Island, many, many anchored boats were crowded in to where the water became turquoise as it shallowed through the cut known as Passo Cecca di Morto. However, this was also where the trip boats came in to drop their guests ashore. From our vantage point further back we were entertained by the goings on of the trip boats as they tangled with these crowded together charter and private boats. There was much honking of horns and on the second day the marine police were called in to move some boats off to create a safe path for the trippers. You have to wonder about the thought processes that went through a skipper’s mind when they decided it was sensible to anchor in the path of a big engined, 30m long trip boat just so they could be that little bit closer to shore. 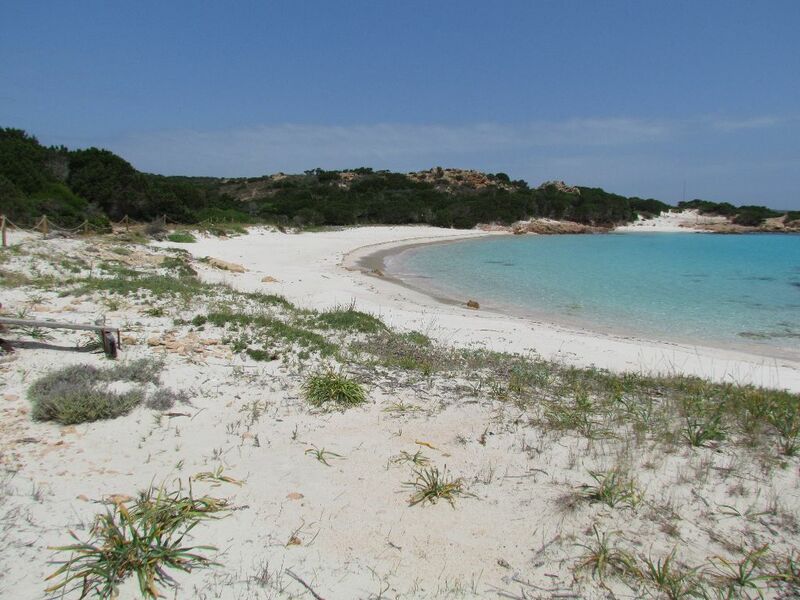 Budelli is the location of the Spiaggia Rosa, an idyllic crescent of pale yellow sand that also develops some pink hues from the crushed shells of sea creatures that washes ashore. The beach is protected from trampling feet and sand collectors, but there is a trail that you can walk to look down on it and around the back. Budelli’s only resident lives in a wooden shack behind the beach, where he’s lived since 1989 and acts as a guardian for the island. From Emerald we watched where other people were going and headed over to a small cove where we could pull the dinghy out. 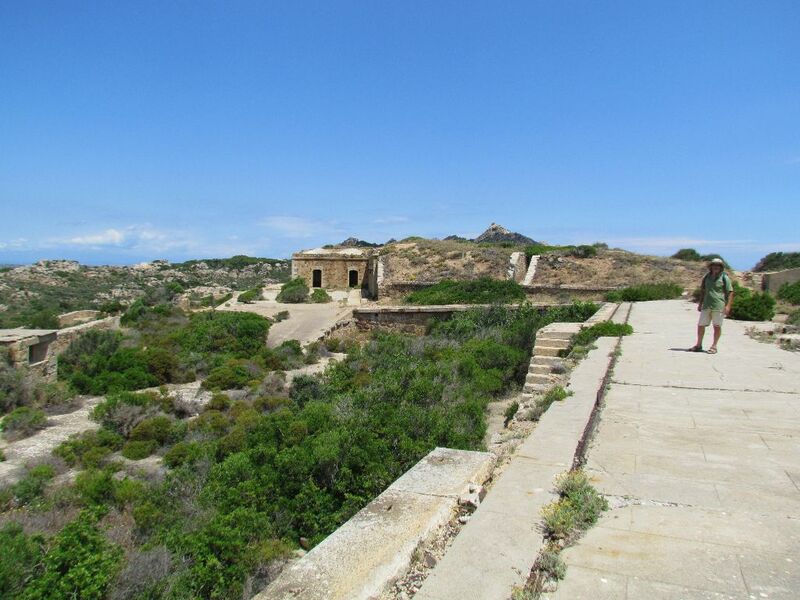 From there, a track ran through the scrubby land, over a small rise and down to the beach itself on the other side. 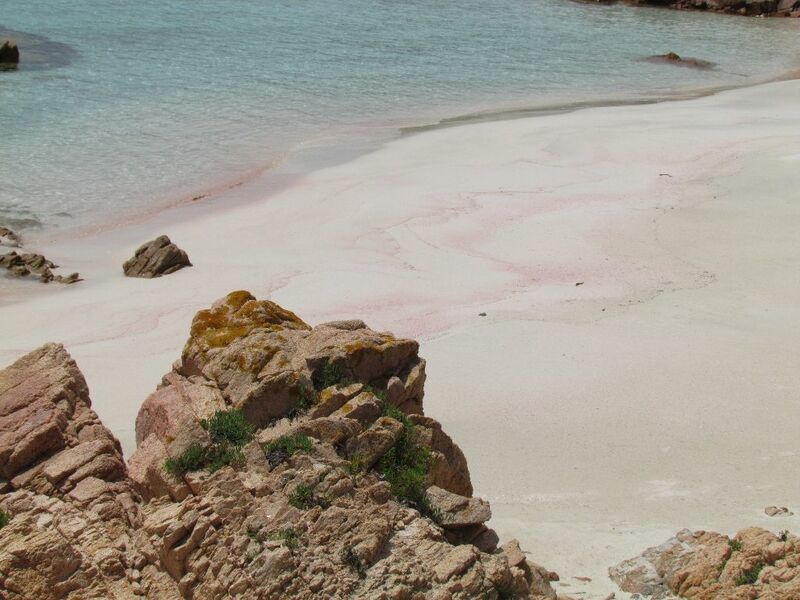 It is a lovely spot, the pink could be seen along the waterline where gentle waves were lapping ashore. We walked along the boardwalk to a side beach where the colour was better defined, the pale swirls of pink against the creamy sand looking like raspberry ripple ice cream. With all the boat traffic passing close both sides of us, other than a quick dip off the stern to wash, swimming from Emerald was probably a route to certain death by a thousand propeller cuts. Instead we dinghied ashore to swim in the buoyed off area of beach. The clear water was a dazzling shade of blue with lots of fish bimbling about the rocky areas. We had only planned on staying one night, but Tuesday morning with the wind still strong from the west we decided to stick with the buoy for the last night on our permit. As boats came and went through the day, plenty of buoys were becoming free so we didn’t feel we were depriving anyone else. It also turned out there were plenty of boats without permits using the buoys too, given how busy the park wardens were working and the cards and cash being handed over. I headed off for a canoe and became involved in our first dinghy rescue for a while. People on nearby boats were just watching the empty dinghy bob by, pushed by the wind so I took chase before it got too far out to sea. But I hadn’t really thought it through – how was I going to get it back to the anchorage against the strong headwind? The National Park guys were out patrolling in their boat so I phoned Colin to call them over to come help me. In the meantime a passing power boat came to assist and tied the dinghy to them before the Park RIB came to the rescue and towed it back to the anchorage. Off I continued on my paddle, but on my return to Emerald, there was the errant dinghy tied to Emerald’s stern. The Park wardens had tried to find the owner but with no luck had left it with us, saying keep it! We did our own search but it was looking like we were going to have to keep it when we spotted a family being dropped off on a boat ahead of us. Colin went over and hurrah! we’d found the owners; they’d parked it on the beach but it had floated free. They were so pleased to have it back and as a thank you gifted us some Czech beer which went down very well watching the England game that evening. It warmed our cockles to have helped them out. Wednesday was our last day in the park and the weather forecast had some strong winds due for Thursday evening into Friday. 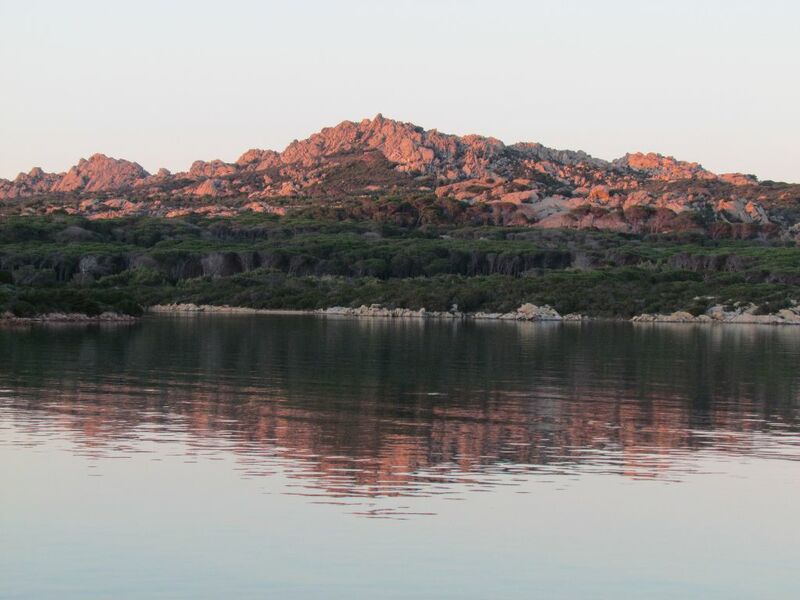 Rather than finding somewhere to hide out on Sardinia, we made a snap decision to head to Porto Vecchio and begin our exploration of Corsica. 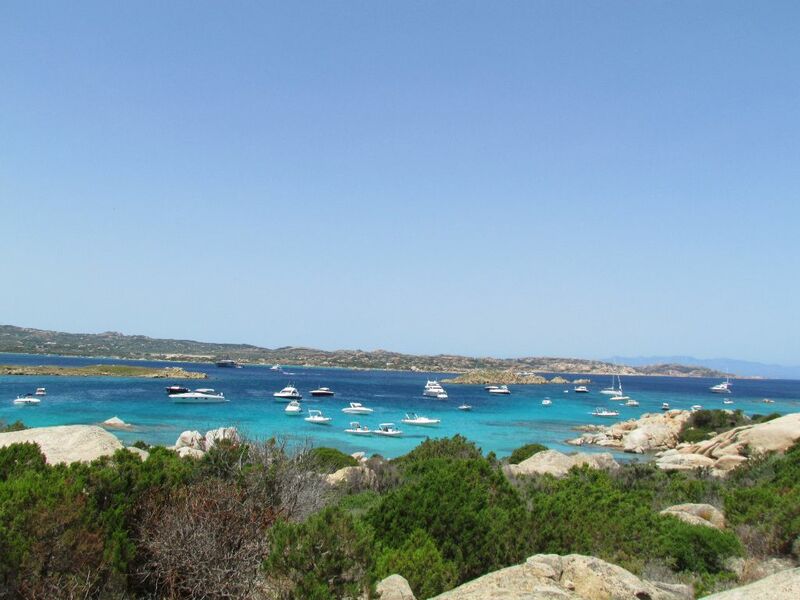 We really enjoyed the Maddalena islands, despite Budelli being our most crowded anchorage so far this season. At least being on a buoy meant no one could snag our anchor! 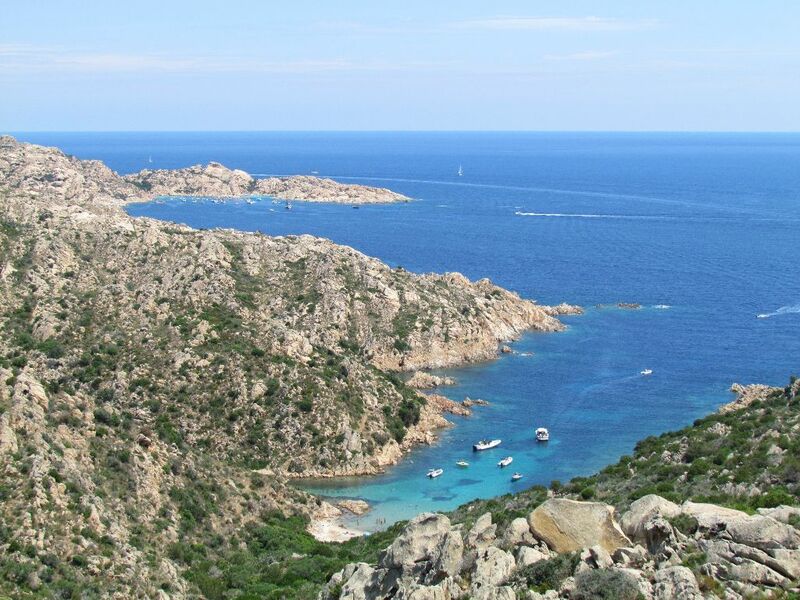 Cala Stagnali has now been added to our list of favourite anchorages in the Med. We hope you enjoyed our blog. If you’d like to receive email notifications of new posts, you can sign up by entering your details in the box at the bottom of the page. There is a small harbour for leaving a dinghy. 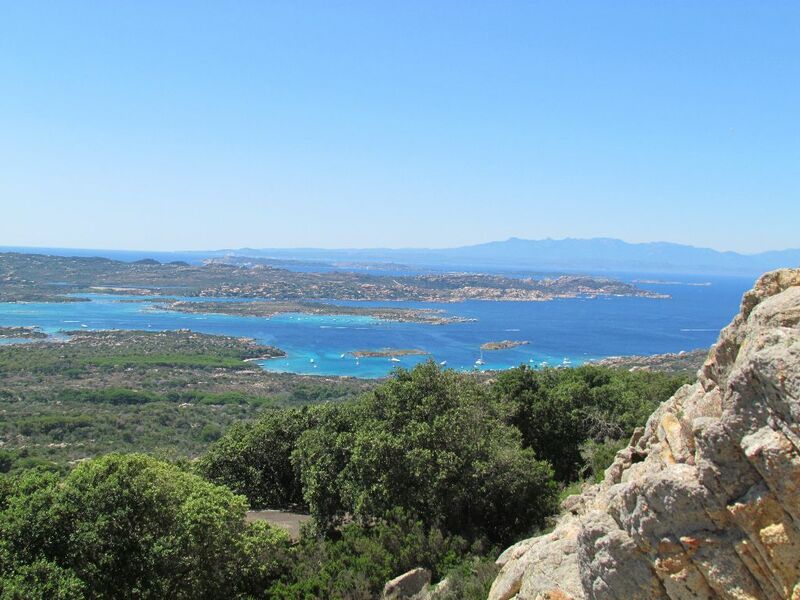 Many hiking trails pass close by as well as a bus to La Maddalena town (E1.50 per person each way, approx 30 mins journey time). There are a couple of museums in the buildings around the small harbour. 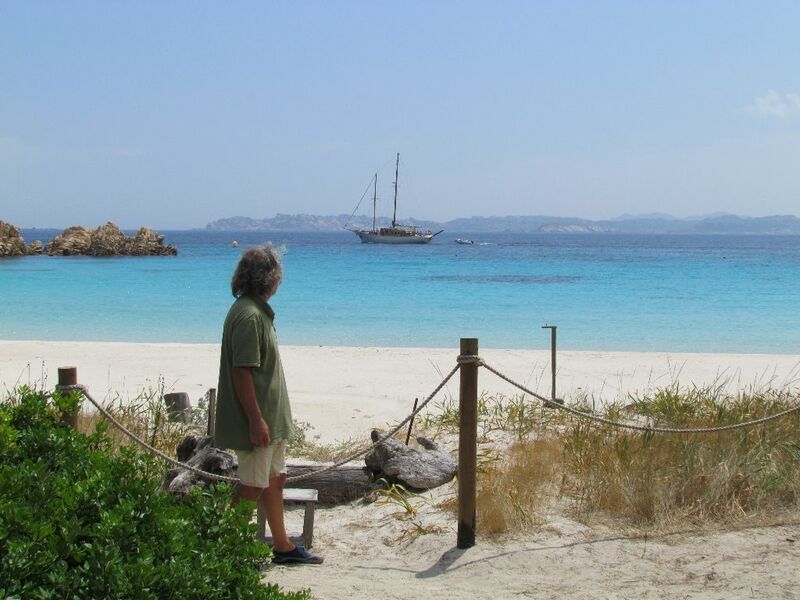 There are two snack huts along the road that runs towards La Maddalena, approx. 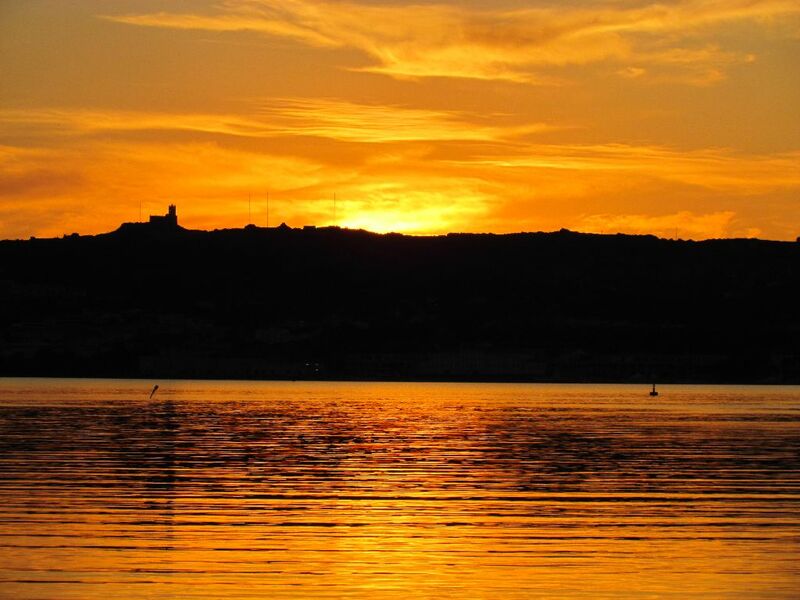 5 minutes from the harbour. There is no charge for the buoys if you have a park permit. Was in the same place 2015. Beautiful. Been around Gib recently But planning to head back towards Sardinia this year, and reading this just makes me want to get there sooner. 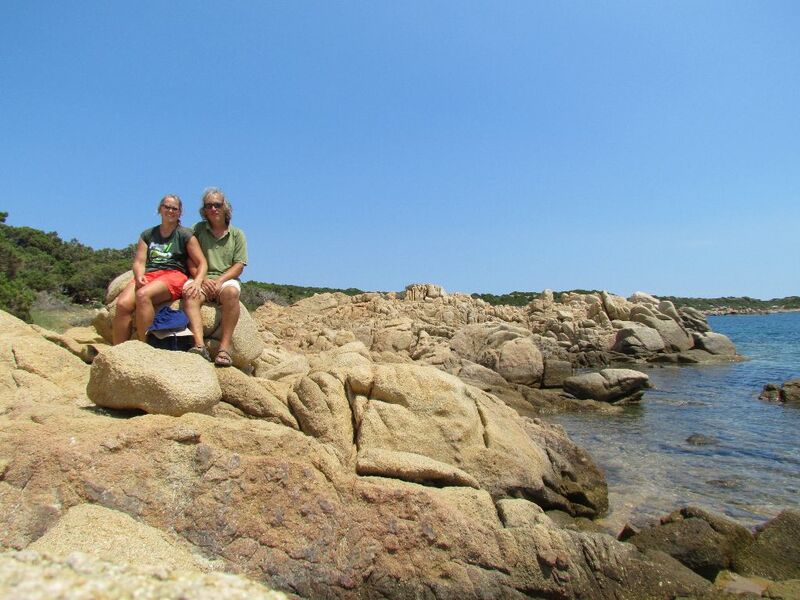 We loved it there and hope to get back to Sardinia this year. HAve a great summer!